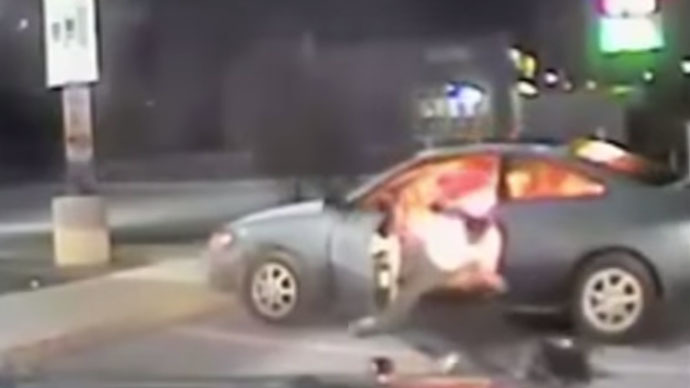 A man rushed inside his car and set it and himself alight at a gas station in the city of Austin, Texas. But the alleged suicide attempt was unsuccessful – he was saved by two police officers, though he received injuries. When the officers arrived, they tried to talk with the man whom they identified as Andrew Guerrero, 57. In the footage, the man is heard saying: "I think I'm going to set the car on fire." He then tried to get back in the car but came back out. "That car got hot quick," Cpt. Andy Reardon with the Austin Fire Department told Texas-based KXAN-TV channel. "We're talking thousands of degrees inside there, you saw the force it created right there. For him to get back in the car like that, to do that, he was very dedicated on killing himself." The man was taken to the Brook Army Medical Center in San Antonio, Texas, with “non-life threatening injuries,” police said, adding that the two policemen received minor injuries. "I'm very proud of the officers' courageous life-saving efforts and relieved their injuries were minor," Austin Police Chief Art Acevedo said. "My thoughts and prayers go out to the person they saved." The man was later charged with First Degree Felony Arson (Vehicle), police added.